I ride a bike that requires no special clothes and has a chain case all year in Chicago approx 4.8mi (7.7 km) each way commute. My friend says our city is too spread out and the people won't ride this far (I suspect laziness and an entrenched car culture). My question: how far is the typical Copenhagen commute? "how far is the typical Copenhagen commute?" Until blogmeister can give you a sensible, well-informed answer, let me just tell you that about one-third of all commuting in Copenhagen is done by bicycle. Rather impressing, I think. I don’t have the statistics but if I and the people I know are indicators I would say that the average commute is 20 to 30 minutes each way. I have no idea how many km that is. blogmeister... i like that. 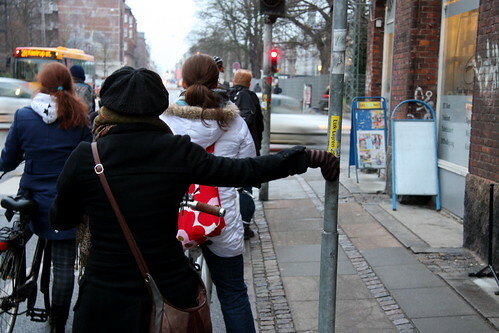 :-) your average copenhagener will rarely be able to tell you how many km their 'commute' is. it's all done in minutes. at the moment i ride about 30 minutes each way. i just google earthed it... 7 km. with that said, the official statistics for commuting in copenhagen are about 6 km each way.